In large bowl, beat cake mix, oil, eggs, sour cream, pumpkin and 1 1/2 teaspoons of the pumpkin pie spice with electric mixer on medium speed 2 minutes, scraping bowl occasionally. Spread half of the batter in pan (about 2 1/4 cups). In small bowl, stir together brown sugar, pecans and remaining 1 teaspoon pumpkin pie spice; sprinkle evenly over batter in pan. Carefully pour and spread remaining batter evenly over pecan mixture. Bake 38 to 42 minutes or until deep golden brown and toothpick inserted in center comes out clean. Remove from oven to cooling rack. In another small bowl, stir powdered sugar, milk and vanilla until thin enough to spread. Prick entire surface of warm cake with fork. Carefully spread powdered sugar mixture over warm cake. Cool completely, about 1 hour. Store covered. When frosting a warm cake, spread in just one direction, using long strokes. 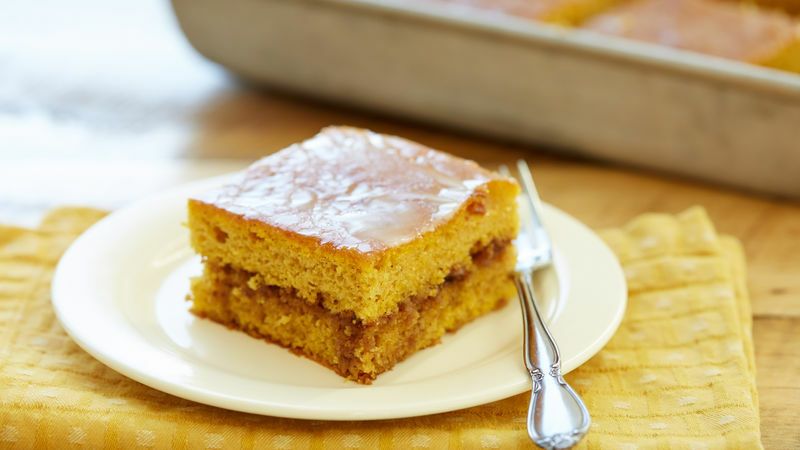 Using a back-and-forth motion often causes the top layer of cake to come off, leaving crumbs in the frosting.